Young children have a remarkable skill: they can recognise numbers of things without counting. This is called subitising, and it develops from a very early age. Very young babies can not only tell the difference between one and two but also between large numbers of dots when there are twice as many in one group, as with 16 and 8 (Sarama and Clements, 2009). Young children also have powerful visual memories and some may find it easier to remember images than words: three-year-olds can recognise three things, although they may not say the word. Subitising can help children to build images for numbers, to visualise and to learn number facts. For instance, most four-year-olds readily learn to recognise five dots on a dice, which helps them to understand the cardinal value or ‘howmanyness’ of five, which they can link to the word and symbol for 5. Structured images like this also help children to begin to see numbers inside numbers, for instance seeing four and one within five. How do you teach subitising? Children’s ability to subitise can be developed by teaching. Games provide repeated experience of interpreting the dot images, either to decide how many spaces to move, as in our activity Playing Incey Wincey Spider, or how many things to collect, as in our activity Dice, where the dotty number determines how many animals to put in your pen. 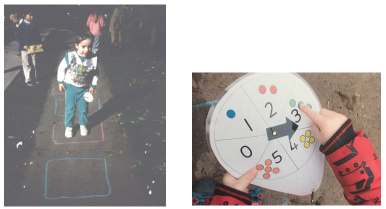 (To find both of these activities, scroll down the collection of number based EYFS tasks.) 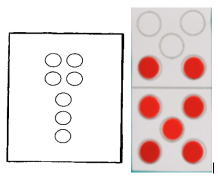 For children who are unfamiliar with dot images, dice can be adapted to just show numbers up to three. 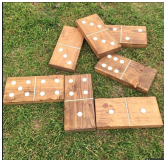 Large dotty dice are good for outdoor games, like jumping along the track. Spinners with dots on provide an alternative, as with the child in the picture, who has his own spinner on a lanyard: he spins it and then makes that many jumps around the circuit track, then does the same again and again and again..! Having your own dice or spinner is a good option for younger children and avoids waiting for turns. Large floor dominoes invite children to match number patterns, indoors or out. Fingers also provide subitisable images for numbers, with the added advantage that they are embodied in muscle memory. Showing all-at-once finger numbers is the key skill here: Marton & Neuman (1990) found that older children with maths difficulties tended to count fingers one at a time, rather than using all-at-once ‘finger numbers’. You can ask young children to first ‘grow’, then ‘show’ and finally to ‘throw’ finger numbers. Using a range of objects and apparatus in different arrangements helps to make children familiar with different images for numbers, while also emphasising different number properties. For instance, Numicon presents numbers as even or odd, whereas linked cubes show numbers as lengths: connecting all these images helps children build a rich network of understanding to link to number words and symbols. Activities include auditory subitising, or recognising numbers of sounds, such as claps or drum beats, linking with movement and music. Subitising can also help children learn addition and subtraction facts. In some of the images below the total number of five is recognised by adding subgroups, like three and two, or four and one (Back, 2014 - see the NRICH article Early Number Sense). This involves part-whole awareness, which enables children to simultaneously see the whole number and numbers which make it up. The ability to think about numbers as compositions of other numbers was described by Resnick (1983) as ‘probably the major conceptual achievement of the early school years’. Recognising how many there are by combining numbers of smaller subgroups is called conceptual subitising: this is more advanced than perceptual subitising, which involves instant recognition (Clements, 1999). Seeing numbers as combinations of other numbers helps children to develop part-whole awareness and build familiarity with number combinations. It is also much more effective than giving children number sentences to complete by counting cubes and hoping they will remember the numbers involved! They may reply, ‘I see three and four’, or ‘six and one’ or ‘two and two and two and one’. This is an inclusive activity with many ‘right’ answers and the opportunity to discover that others see the same thing differently. Children also learn about all the different combinations which can make the same number. An alternative is to use giant magnetic buttons on a tray, which you turn over to secretly rearrange and show different combinations of the same number. Not only do younger children respond more to real objects than to images on a screen, but they can also see that the number of buttons stays the same despite being rearranged. More complex images can present greater challenges for some children. Mulligan and Mitchelmore (2009) showed young children a 6 dot triangle and asked to draw it from memory: they found their responses varied significantly, with some just drawing a lot of dots. Even when asked to copy the image, many five-year-olds produce dotty triangles like the one on the right, apparently finding it hard to focus on the number and the arrangement of the dots (Gifford & Thouless, 2018). This implies that some children will need a lot more practice in looking and talking about number patterns, in order to see how they are organised. Daily ‘number talks’ can help children to analyse and visualise number images, building an understanding of cardinal values, like the ‘sixness’ of six. Reception children enjoy creating their own arrangements for numbers like seven and nine, and seeing which their friends recognise most easily. Older children with mathematics difficulties found the ‘lollipop seven’ image most memorable, at the same time learning a key number fact, that four and three make seven (Emerson & Babtie, 2010). In Hungary, children are taught to recognise such numbers as ‘five and a bit’, using the dice image for 5 and linking with finger numbers (see the NRICH article From Objects and Images to Mathematical Ideas). In the Netherlands, researchers developed bead-strings and rekenreks (counting frames) using groups of five, as they found these helped children to ‘see’ numbers more quickly (Gravemeijer, 1991). Being able to subitise groups supports children’s understanding of larger numbers and later multiplicative thinking: for instance, recognising larger numbers by counting groups of two, three or five. Subitising with everyday objects is more challenging than with simpler shapes, like dots. 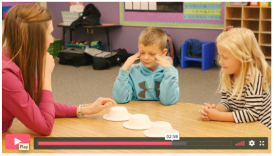 However, it can be more engaging for children to discuss images which are of particular interest and relevance to them, or even to create their own images for number talks. Emerson, J. & Babtie, P. (2010) The dyscalculia assessment: Emerson House Mathematics London: Continuum. Resnick, L.B. (1983) ‘A developmental theory of number understanding’ in Ginsburg, H. (ed) The development of mathematical thinking. London Academic Press 109 – 181. Sarama, J. S., & Clements, D. H. (2009). Early childhood mathematics education research. London: Routledge.